A crowd of elk-aholics gather to watch their favorite show: Battling Bulls! Photo by Derek Stoner. After a spectacular sunset and good views of a bull elk and his harem of cows the first evening, what would our second evening bring? Once again our DNS van navigated the steep hills above the village of Benezette to arrive at the legendary Winslow Hill wildlife viewing area. A long procession of vehicles and camera-toting tourists soon signaled our quarry’s presence. 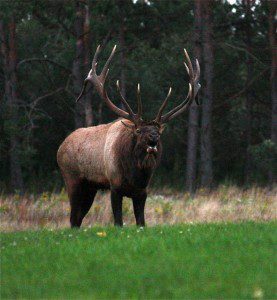 A mature bull elk bugles in defiance! Photo by trip participant Molly Daly. 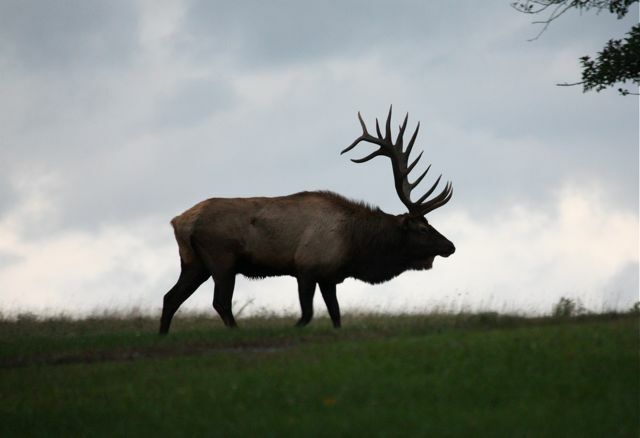 A weedy field served as the parade ground for a mature bull elk and his seven cows. 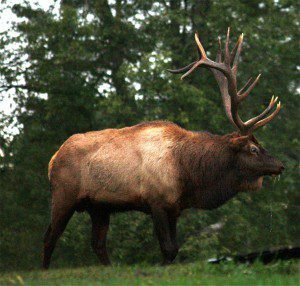 The bull sported an impressive six points (tips) on each antler, making him a 6X6 in elk-watcher parlance. This 800-plus pound beast bellowed and bugled to advertise his dominance. The enraged 6X6 bull, drooling from the mouth and nose, does his best to look intimidating. Photo by trip participant Molly Daly. Caught up in frenzy of the mating season, this bull was drooling and showing the whites of his eyes. He raked bushes with his antlers, pawed the ground, and orbited the herd, checking on the status of his cows. The 6X6 bull heads back to be with his harem of cow elk. Photo by trip participant Molly Daly. 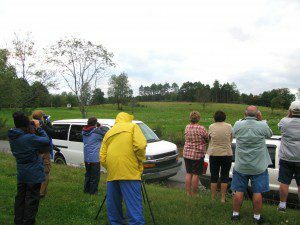 The distant bugle of another bull captured the attention of the 6X6 and riveted the dozens of viewers along the field edge. From the valley below, the interloper emerged. Amazingly, the new arrival sported an even-larger rack (7X7) and larger body. The two bulls postured and bugled, slowly approaching each other. With the moment of truth arriving, the viewer’s held their collective breath. Would they clash and lock antlers? Heads turned sideways to guage each others size, the bulls circled round like a couple of heavyweights unwilling to fight. The more-energetic 6X6 would make short charges towards the interloper, who did not seem to have much aggressive drive. The showdown lasted nearly an hour. As dusk fell, the 7X7 finally backed off and left the scene.